The Church of Scotland serving the communities of Birse, Ballogie, Finzean and Strachan in Aberdeenshire. Our church is located in Finzean, just off the B976 South Deeside road, between Banchory and Aboyne. Services are normally held at 11 a.m. every Sunday, with a creche and Junior Church during term-time. We are a friendly and varied congregation and we welcome newcomers and visitors alike - even those who just want to give it a try! Visitors to the church cannot fail to notice the large banner which was based on an original painting by the late Mr Brian Hart. He gave his permission for the ladies of the banner group, under the leadership of Mrs Margaret Ross to recreate it in fabric. It was dedicated to mark the new Millennium. The composition is dominated by the figure of the crucified Christ with his outstretched hands pointing to the present time, dividing the image into the past below and the future above. He is superimposed against the tree of life, the roots of which are planted in the Celtic Church , which brought Christianity to Scotland. Above the centre line, the symbols all represent Deeside: blue—the river; green—the conifers rising up the side of the valley; purple—the heather; and brown—the scree and rocks above the tree line. The sun rises on the new millennium and departing swallows represent freedom and hope for the future. The twelve outer cusps are the universal symbols for time. The whole design is a butterfly which symbolizes resurrection and transformation. Several other impressive banners are displayed in the Church: pictures can now be seen the photo gallery. The building was originally erected in 1863 to be a Mission Station within the ancient parish of Birse for the people of Finzean. In 1903 it then became a parish Church for the people of Finzean. 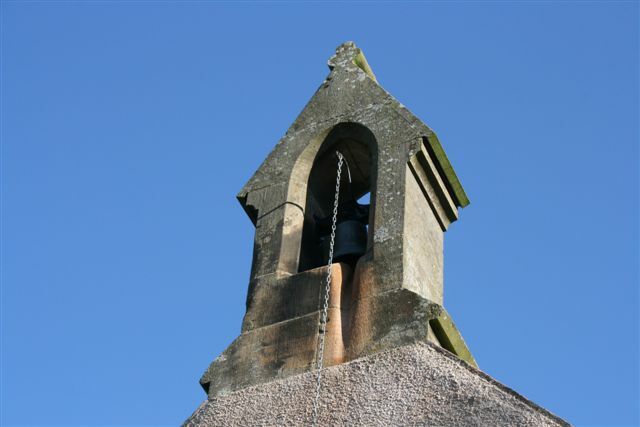 In 1987 it became one of the four buildings used by the union of Strachan, Birse and Finzean parishes. On Sunday 31 July, 2005, it began a new role. Just as the original building has been extended to has its purpose. This building is now the sole parish church for all the people of Strachan, Glendye, Ballogie, Birse, the Forest of Birse and Finzean. To be a sustainable rural congregation with a long-term future. To be a Community Church where everyone is welcome and everyone is needed.